BOYNE CITY – Boyne City High School has taken a standard classroom space and turned it into what looks like the scene of a lineworker training grounds – sections of utility poles are connected with thick electrical conduits, hefty leather toolbelts are loaded with every necessary tool of the trade, and critical supporting equipment lines the walls. 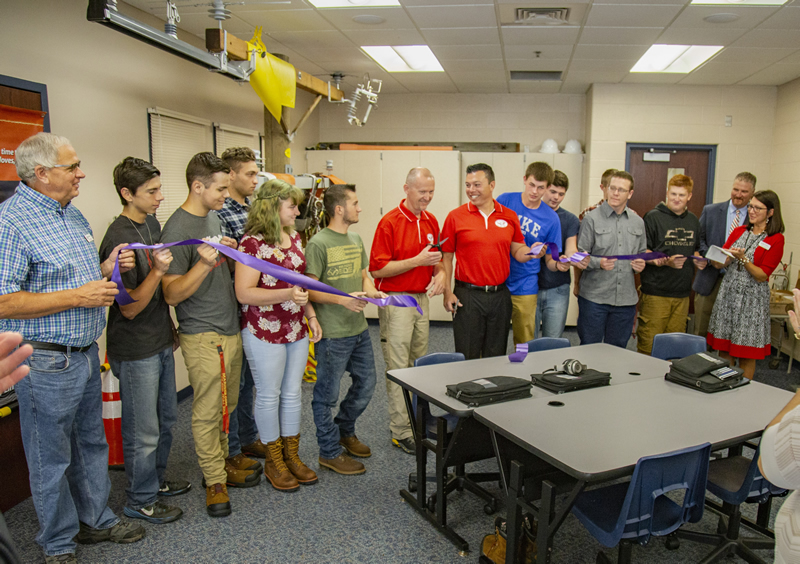 This newly converted classroom houses Energy Fundamentals: Lineworker Emphasis, a new Career and Technical Education (CTE) program launched on the first day of the 2018-19 school year. A ribbon-cutting celebration took place on the morning of Sept. 11, 2018 with students, teachers, invited guests and collaborative partners. The Energy Fundamentals program is the result of a collaboration among several partners, notably Boyne City Public Schools, Char-Em ISD, and three prominent utility companies: Great Lakes Energy as the lead entity, with strategic support from Consumers Energy and DTE. While the program is housed in Boyne City, it is open to any student in any district throughout Char-Em ISD, as are all CTE programs. The inaugural class has 10 students from Boyne City, Boyne Falls and East Jordan school districts. The pre-apprenticeship program, for juniors and seniors, is a two-hour daily course for one full school year. Students learn basic yet essential concepts of working in the electrical field while developing skills and knowledge to work as a lineworker installing and repairing overhead lines. Training takes place in the classroom and at the Great Lakes Energy headquarters in Boyne City. Erin Smith, 17, and a junior at Boyne City High School, said she is ready to dig in to the program and sees the field as a possible career path after graduation. Students like Erin are learning from highly experienced teachers who are lineworkers themselves. Instructors are Derek Maki, a GLE lineworker with 16 years of experience and a graduate of Northern Michigan University and Alpena Community College; and James Rincon, also a GLE lineworker who brings 10 years of experience both in Texas and Michigan. Boyne City Superintendent Pat Little said the district is thrilled to participate with a program that will set students up for success in a field that will have many opportunities in the years ahead. Michigan’s energy industry accounts for nearly 100,000 jobs with demand projected to increase by nine percent through 2024. Nearly 50 percent of the energy workforce is becoming eligible for retirement in the next few years, opening opportunities for new workers. Median salaries in the energy industry range from $51,572 to $88,027 with an associate degree and industry credentials, according to Pure Michigan Talent Connect. “This partnership with Great Lakes Energy provides students with access to instructors directly in the field while still learning the standards set forth by the State of Michigan in this area. The partnership blends industry-ready learning here at Boyne City High School,” Little noted. Consumers Energy staff also played an important role in developing the curriculum, which the company does on a state-wide basis to train its future workforce. Energy Talent Pipeline Specialist Amber Fogarty was on hand for the celebratory program launch, and she said the students will utilize a nationally developed curriculum for energy fundamentals. Little said the collaborative spirit brought the program to such a successful launch. 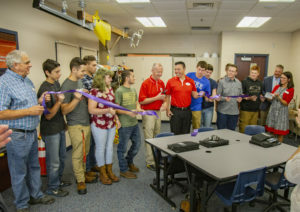 “Everyone should be commended on the teamwork and vision for this program: the energy companies, energy industry suppliers, Char-Em ISD, the high school principal Karen Jarema, BCPS school board, and most importantly, our students for having an interest in learning this trade,” Little added. Students who successfully complete the program will be ready to apply directly to possible employers for an apprenticeship. Similarly, students may choose to attend a pre-apprenticeship program with a regional community college. The course complements five programs in the Boyne City vocational department: Visual Imaging, Business, Marketing, Hospitality/Culinary Arts and Construction Trades. Funding for this new program will come from several sources: Boyne City Public Schools’ general fund, the Char-Em Career and Technical Education Millage, and the new Regional Enhancement Millage, approved by voters in Nov. 2017. For more information about this or any CTE program, contact your high school principal or counselor.